The first stop on my Magical Mystery Vacation Tour ™ was a few days spent in London, England. 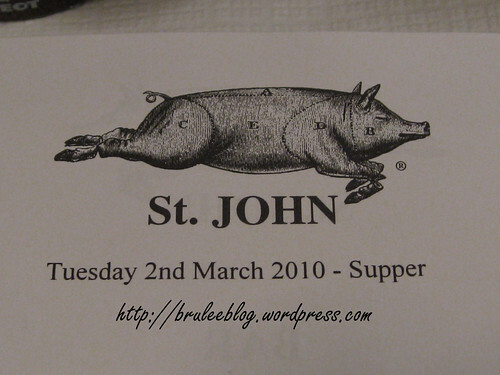 As soon as I knew that would be on the itinerary, I put a visit to the St. John restaurant as #1 on my to-do list in London. I’ve been to London before, but this was a place that I was not able to visit due to time, lack of funds, and the lack of desire of my travelling companion to eat there. This time, I vowed, I would eat there solo if I had to. Luckily, my two friends were interested in sampling the food too! For some odd reason, I didn’t write down any notes – during or after the dinner. But I’ve got notes on every other place I ate at during the month so I’m not quite sure what happened. Please bear with me if my memory is a little hazy on details. 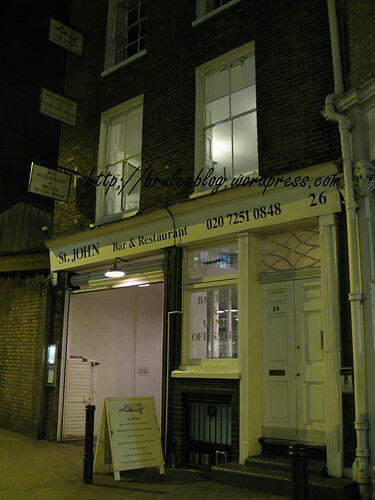 Founded by English chef Fergus Henderson, there are actually two St. John restaurants in London – the original, which is the one I went to, and St. John Bread and Wine, which has a few different menu items and a bakery. The original restaurant won a Michelin star in 2009 and maintained its star for the 2010 guide. Their specialty is nose to tail eating, where they serve offal among other things. 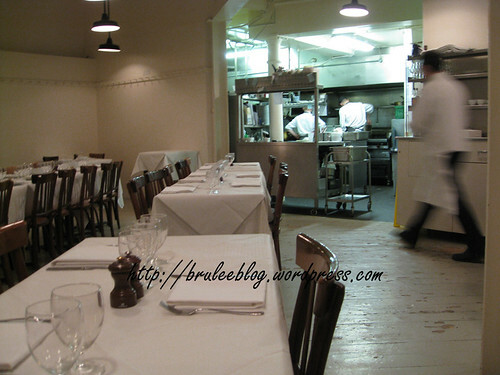 The restaurant is rather nondescript from the outside and was almost easy to miss, especially because it is located in Smithfield, a neighbourhood full of restaurants and bars, as well as the centuries-old Smithfield meat market. The inside of the restaurant is very simple too – white walls, white paper tablecloths… even the waiters were dressed in almost all white. The first thing you see when you enter the building is the bar area which is a little more casual and has a number of tables and chairs for dining. The restaurant itself is up a small staircase. 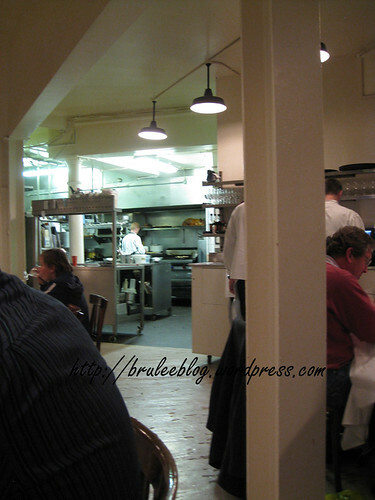 The kitchen was open to the dining room and I was able to take a slightly blurry photo. If you look closely you can see the whole pig that someone pre-ordered for a party that evening! Okay, now to the food. First, the menu. Prices are in pounds. None of us were terribly hungry (unfortunately) so we ended up ordering smaller plates or sharing large dishes. 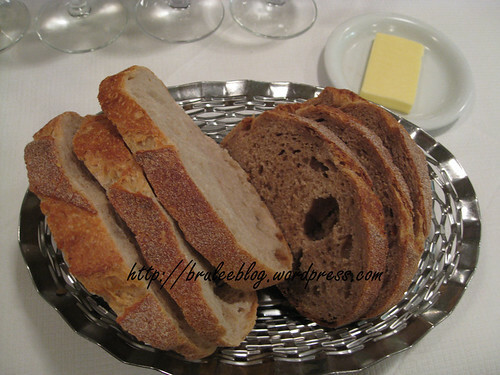 The bread that was served was nothing special in my opinion, but was fresh and served with unsalted butter. I was surprised that they didn’t have bread that would make a better impression since there is a small bakery on-site and a larger one in their other restaurant. 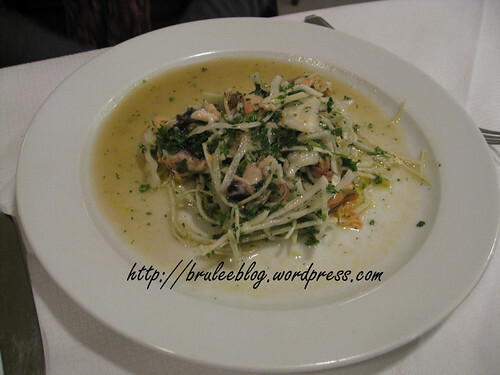 One person had a plate of Mussels, White Cabbage and Chervil. It was a cold salad that mainly tasted of the crisp cabbage. It didn’t wow anyone but it was a decent salad if you like cold mussels. For me, I think I had to be in the mood for a seafood salad to really enjoy this, but I was anxious waiting for the meat to come. 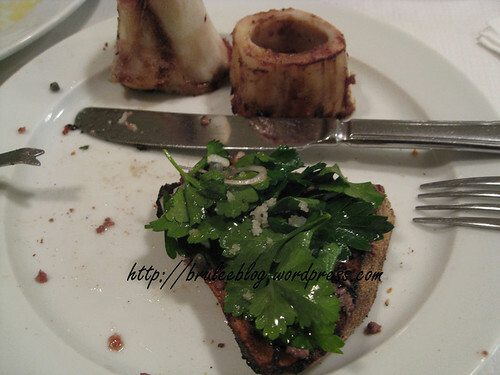 I and another friend shared the Roast Bone Marrow and Parsley Salad. The plate arrived with two sliced of toast,a small pile of parsley, onions and capers dressed in a vinaigrette, a small pile of salt, and four pieces of bone marrow. At first glance this dish doesn’t seem very big but it is very, very rich and I would recommend sharing this appetizer with someone else unless you are planning on eating very lightly for the rest of the meal, or are planning on bypass surgery anyway and want one last hurrah before going to the hospital. We were given lobster picks to use with the marrow. 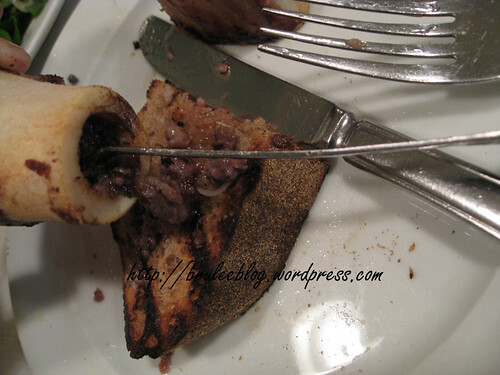 It worked up to a point, but the little pick made it difficult to scoop out the last bits of marrow in each bone. Sharing the dish worked out well as the two taller pieces were slightly fatty, and the two shorter pieces were slightly meaty tasting, so we each ended up with a mix of both textures. 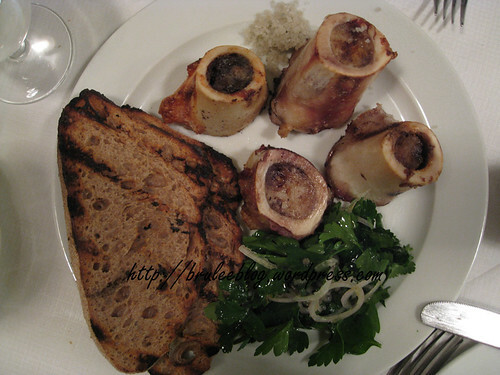 The serving staff suggested that we eat the dish in this manner: scoop out the marrow onto the bread, add some of the salad and top it off with a sprinkle of salt. When piled as per our instructions, each bite was a mix of delicious richness tempered by the vinegary greens and bite of salt. 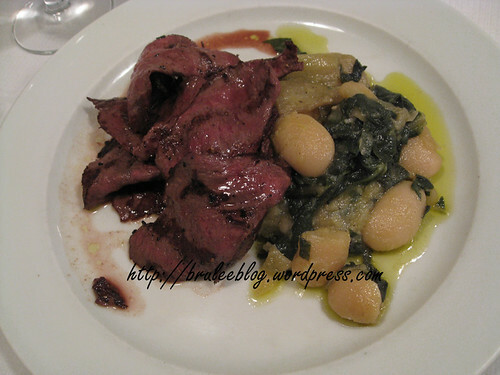 The same friend and I had decided to also share our entree, and opted for the Ox Heart, Chard and Butterbeans. The ox heart tasted like extra tender slices of thin steak; the meat practically melted in my mouth. The chard and butterbeans were served with olive oil and was a good accompaniment to the meat. My only criticism of this dish would be that the beans were on the verge of being mushy as they were peeled, and I think I would have preferred the skin to have been left on. The heart was definitely the star of this dish, and I think I liked it even better than the bone marrow. We seriously considered ordering another plate of this dish but we all really wanted to try the desserts. My other friend, who didn’t have much appetite that night, ordered the Welsh Rarebit to try. 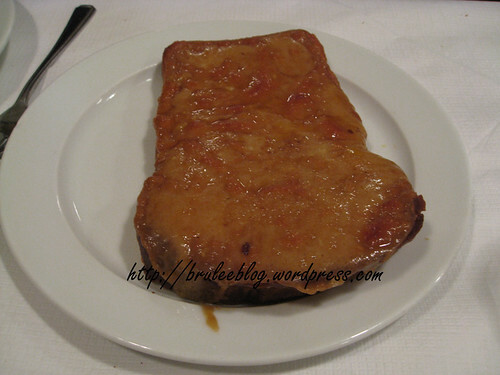 Looking like a giant piece of grilled cheese on toast, the rarebit was rich (like most things on this menu). The cheese was thickly layered onto the bread and there was a strong taste of the alcohol used to make this dish (not sure if it was an ale or a porter beer). In the photo you can partially see a fork on the side of the plate – that will give you an idea of the size of the rarebit that was served. Friend #2 ordered the Poached Rhubarb and Buttermilk Ice Cream. The ice cream was creamy and delicious. The rhubarb was watery, mushy and not very sweet, and frankly felt more like a soup than a dessert. 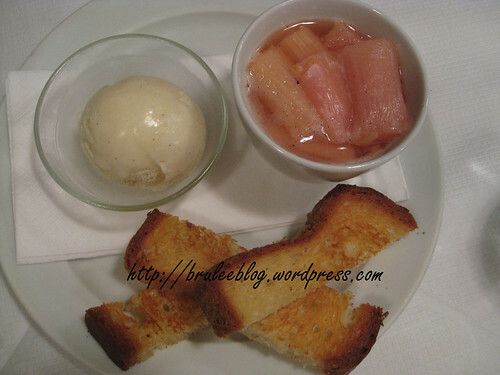 They also served toasted brioche with the dish. The bread was light and fluffy on the inside and had a nice crisp on the outside, but was served completely plain and it felt a little odd dipping it into the rhubarb liquid. None of us really enjoyed anything on the plate except for the ice cream. 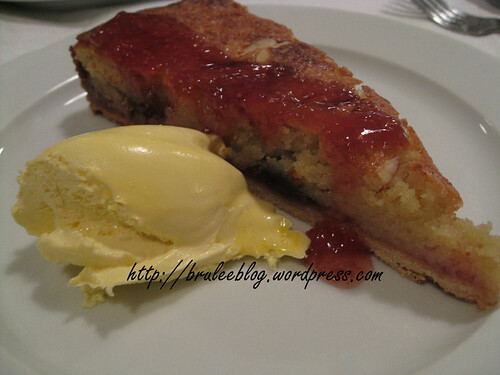 And lastly, my dessert choice was the Fig Bakewell Tart and Jersey Cream. The tart was slightly sweet and tasted of fresh figs and almonds, while the cream was dense and rich. I think I moaned every time I took a bite. 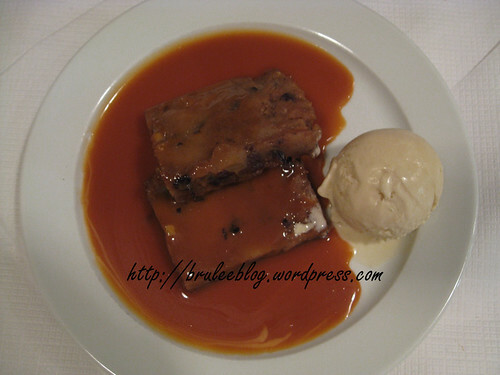 Overall impressions – simple, hearty traditional English food that mostly succeeds (although a few things still need work). Service was mostly efficient and polite but didn’t feel friendly or attentive – something that I was surprised to see in a starred Michelin restaurant as my previous experiences in similarly rated restaurants usually require a certain level of service. 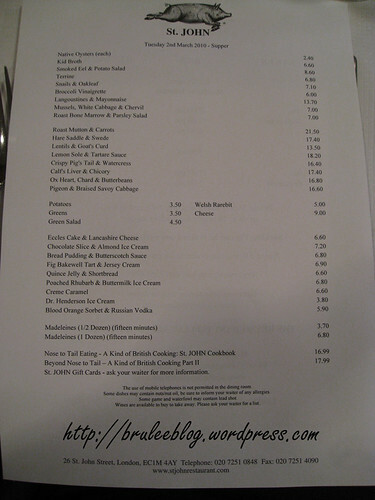 Prices are pretty much what I’d expect from a Michelin-rated restaurant, although some people may balk at paying prices like that for what is relatively simple food. The dining area felt a little stark and sterile due to the purposeful lack of decor and paper-lined tables. I knew what to expect, having seen photos of the restaurant before, but I was still surprised at how much the decor affected the atmosphere. It doesn’t feel like a place where you’d want to sit back with an after-dinner coffee and or another glass of wine. Would I go back? Probably just for the food. 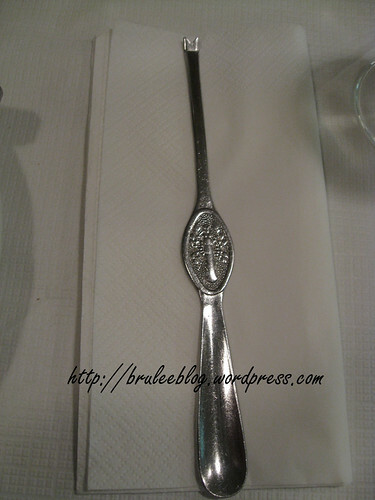 For another very recent review of this restaurant, check out A Canadian Foodie‘s visit! Well, wonderful – if you would go back for the food. I would not. I envy you. It would have been a blast to go with so many to have such a variety. I had a gal comment on my post the other day (ps I went there last week, too, and wrote about it…) anyway, she was so passionate about my feelings. I actually wrote to her personally, and it was a very interesting discourse. She could not understand that anyone could have a bad meal there. I wished I had her experiences. I loved your detailed description of the site. 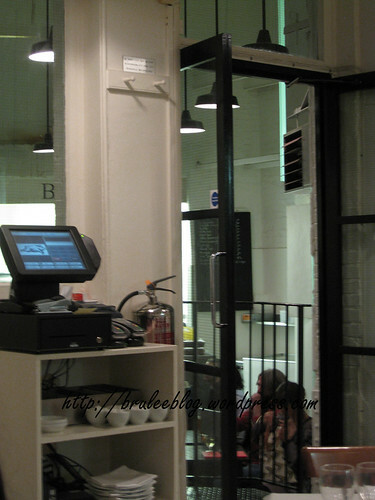 That same pig was in the kitchen when I was there (hehe_, except my photo of it was blurry, so it never got in. Honestly, I forgot it was a Michelin Star restaurant. We just went for the quintessential British traditional cuisine experience. I was really wishing Fergus Henderson was cooking my meal. I love Home Food. I love heart, and other “rare bits”. so, YUM. I was so pumped for the experience. And, you know from reading my work that I am essentially an easy to please knock over. From reviews I’ve seen about the restaurant before, I think polarizing opinions are common. There are people who defend the place to the utmost, and others who just plain don’t like it. I think I ended up falling somewhere in between. And yeah, it didn’t feel like a comfortable place to hang out – to me at any rate. Too sterile. I think the bar downstairs may have been a bit more to my taste. What a fabulous experience. I sense a hint of disappointment, but satisfaction nonetheless. Nice review.